Two theorists have devised a simple, widely applicable model1 for characterizing the ways in which ultracold molecules interact under a range of conditions, improving researchers' ability to control, measure and understand phenomena in one of the most exciting fields of modern physics. Ultracold systems are those in which the atoms -- or, very recently, molecules -- under study are trapped at temperatures lower than one-millionth of a degree Kelvin above absolute zero, far colder than the remotest voids of interstellar space. In that regime, where the chemistry of reactions is dominated by quantum-mechanical effects, a small object like an atom or molecule can reveal new and unanticipated forms of behavior. But ultracold systems can also serve as precision-tunable models for the way that atoms and particles act in condensed-matter systems, and they may eventually provide a platform for quantum information-processing and computation, among other uses. Ultracold molecules, first created in large numbers and in their vibrational ground states in 2008, are particularly promising. "They have a lot of potential things to offer that you don't get with ultracold atoms," says JQI Fellow and co-author Paul Julienne. "Atoms are neutral and have very short-range forces, whereas molecules can have dipole moments -- and the dipole moments can give rise to very long-range forces." Because of their polar nature, such molecules can be controlled by applying electrical fields, making them prime candidates for a host of experiments. Julienne, a theoretical physicist at NIST, is the principal investigator of a Multidisciplinary University Research Initiative (MURI) grant from the Department of Defense titled Ultracold Polar Molecules: New Phases of Matter for Quantum Information and Quantum Control. "The broader scope of our MURI project is to utilize polar molecules for applications," Julienne says. "But first we have to characterize their interactions and collisions." For example, researchers "need to know whether, when the molecules collide, they immediately destroy themselves." That is a serious worry, because collisions can release energy orders of magnitude larger than the delicate energies applied to coax ultracold atoms to form molecules in the first place, blowing the molecular components out of the trap. "If they react, they're gone," Julienne says. "So one of the most fundamental issues is -- can we make stable gases in spite of the fact that the molecules are highly reactive? We think we can, but we must find ways to protect the molecules from bad collisions." To do that, it is necessary to determine which quantum-mechanical variables govern which aspects of molecular interactions, and how those variables are related mathematically, so that for any collection of molecules one can predict the rate at which reactive/destructive collisions occur. Julienne and Polish colleague Zbigniew Idziaszek at the University of Warsaw devised a way to calculate rate constants for such collisions by separating out the very different effects of long-, medium- and short-range interactions. 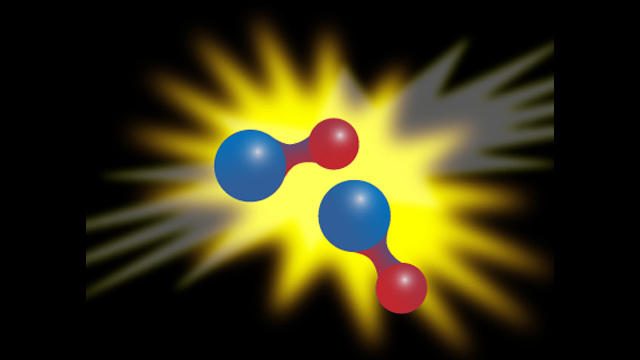 A destructive chemical reaction cannot occur unless the molecules are extremely close – no farther apart than 1 nm. Some get that close and some do not. What determines the difference? It depends, the theorists found, on quantum properties of the molecules (in particular the spin state, or angular momentum) and their interactions at various distance scales. Different spin states cause very different interactions at the critical medium-range distance range of 1 to 20 nm; and what happens in the short range (below1 nm) can affect the de Broglie waves at long range, beyond about 20 nm. If the two molecules are in the same spin state, then the approaching molecule will likely be diverted because the identical-spin condition creates an energy barrier, much as two electrons in the same orbital of an atom are prohibited from having identical quantum states. Most of the time, this barrier prevents a reaction. However, the laws of quantum mechanics allow for a small probability that objects with the right wave characteristics can pass through otherwise forbidden energy barriers, a phenomenon called tunneling. That process permits a small number of identical-spin molecules to get close enough to cause a reaction. If the two molecules have opposite spins, there is no similar energy barrier. But there is another action that affects the outcome. Owing to a peculiarity of quantum mechanics which has no counterpart in classical physics, de Broglie waves can “reflect” off an attractive potential. So as the matter wave that characterizes the colliding molecular pair begins to interact with the attractive van der Waals potential of the pair, some of the matter wave may be reflected backwards. When that occurs, the quantum-mechanical phase of the reflected wave interferes with the remainder of the incoming wave. Depending on how it interferes, it can affect the properties of the matter wave, and thereby increase or decrease the likelihood that the two molecules will get close enough to react. If a molecule actually gets past the 1-nm short-range boundary, then the probability of a reactive collision and the type of reaction are governed by complex chemical forces. The outcome can range from what Julienne calls the “black hole” case (because virtually no wave flux is reflected back out to long range) to “white holes” in which waves reflected from the collision site extend all the way out to strongly affect the de Broglie wave tens of nanometers away, to “gray holes” somewhere in between. The calculations produced an extremely good fit to experimental data from studies of ultracold potassium-rubidium molecules by a team at JILA, NIST and the University of Colorado in Boulder, CO. (Those results, published in Science,4 are described here.) But in a broader context, the theorists' model explains why some three-dimensional molecular gases can persist for relatively long times, and why some aggregations result in nearly immediate loss of all molecules from the energy released in high collision rates. "What our simple little theory does is describe anything from ‘black holes’ to ‘gray holes’ to ‘white holes’," Julienne says. And it suggests that understanding and controlling the relationship between only two parameters -- the quantum-mechanical phase and short-range reaction probability of each colliding pair of molecules -- may make it possible for scientists to fine-tune the collective behavior of the gas molecules. "What that means," Julienne says, "is that controlling a tiny, almost negligible amount of cold molecule energy, on the scale of a few billionths of an electron-volt, can control an electron-volt's worth of strong interaction at short distance. So by adjusting external fields, we're controlling a whole chemical reaction. It's the tail wagging the dog." The new model indicates that in molecular gases confined to two dimensions (or in a one-dimensional line), careful control of the molecules' orientation and quantum states should ensure longevity of the gas. This may be possible in an "optical lattice," a two-dimensional grid formed when counter-propagating laser beam waves intersect and interfere with each other in ways that confine the molecules in a uniform geometrical pattern. This possibility has been predicted by Peter Zoller's group at the University of Innsbruck, an international collaborator on the MURI project. 1 See first reference publication. 2 For a description of how these molecules are made, see “A High Phase-Space-Density Gas of Polar Molecules,” Ni et al, Science 322, 231 (2008). 3 The van der Waals force is much weaker than covalent chemical bonds or electrostatic interactions, but plays a major role in attraction between molecules – even in macroscopic situations. It can, for example, permit geckos to climb up vertical glass sheets by exploiting only the weak attractions between the molecules in the animal's foot and molecules in the glass. 4 See second reference publication.